We meet Linda Clare, Professor of Clinical Psychology of Ageing and Dementia at the University of Exeter. Living with dementia is challenging and all too often people with the condition and their families feel they do not receive adequate support. People with dementia want to remain involved with their families and communities and wish to enjoy their life, despite any limitations the condition imposes. We aim to understand how to make this possible. To accomplish this, we are following a large group of people with dementia and carers over time to find out about the things that influence their experience and make a difference to their lives. The IDEAL project – Improving the Experience of Dementia and Enhancing Active Life – was funded by the Economic and Social Research Council and the National Institute for Health Research, and we have an outstanding team working on this unique project. There is an increasing recognition that a social science perspective has a great deal to offer in providing insight on how people can live well with dementia. And that’s a shift from the usual perceptions of dementia, which tend to be very negative? Yes – it is often described in the popular press as a ‘living death’, and it is one of the most feared health conditions among the over-50s. Although it will inevitably progress, for many people dementia is a long-term disability and we need to consider what will improve quality of life through the course of the condition. ‘Living well’ has become a key focus of UK government policy; we wanted to find out find out what living well with dementia means and what makes it possible. We are exploring how psychological and social factors influence the possibility of living well and what resources people need at different stages. We are currently following up 1500 people living with the early stages of dementia over a two-year period to see how things develop and change for them. Many of our participants have a caregiver who is also taking part, but we also wanted to include people with dementia who are on their own. These people are often excluded from studies as there is nobody to report on their behalf. We are visiting our participants at yearly intervals. Our first set of funding covered three time-points, 12 months apart… additional funding from the Alzheimer’s Society is allowing us to follow our participants and carers for six years in total. What methods are you using to get your data? IDEAL is a longitudinal cohort study using a mixed-methods approach. People with dementia and carers are completing questionnaire surveys during visits from a researcher. The questionnaires cover a wide range of issues, and we have also included several open-ended questions asking people to describe what living well with dementia means to them. We are looking at social, economic, environmental, physical and psychological factors, access to and use of health and social care, and uptake of community resources. Our group is also exploring the challenges of living with dementia and other physical and mental health problems that participants may have, and the extent to which they are dependent upon others for help. Where caregivers are involved, the perceived quality of this relationship is also being considered. The study is also investigating how people adapt to the condition, the challenges they experience and how they cope with them, together with key indicators of living well with dementia, such as level of wellbeing, quality of life and life satisfaction. Participation in social activities and the experience of positive emotions are also being explored. Carers complete their own questionnaires and also provide information about the person they care for. We are also interested in the services people with dementia use and the associated costs. To find out more about this issue, we will be linking data from the IDEAL survey with participants’ health records. A small subgroup of participants is being interviewed in more depth. We are targeting people who have changed markedly between the different phases of the research – those whose ratings of quality of life and wellbeing have either improved or declined. This will provide insight into what they think might have made a difference and will feed back into our analysis of the quantitative data. So how can you live well with dementia? What are your initial findings? We are currently analysing the statistical data from the first wave of assessments, so the main findings so far come from our first set of qualitative interviews and a large systematic review of factors associated with better or worse quality of life. The systematic review synthesised statistical information from over 100 studies, including data from over 30,000 people with dementia. We found that factors reflecting positive relationships and social engagement were most closely associated with better quality of life, whereas poor mental and physical health was linked with reduced quality of life. Our qualitative findings also emphasised the importance of positive relationships, as well as engagement and purpose in life. These findings fit in well with our enablement approach to intervention that aims to help people reclaim their independence and enhance their feelings of self-efficacy and agency, while also knowing that they do not have to cope alone. You have been working with various agencies to ensure that people with dementia have a considerable input into your research. How does that work? The IDEAL project is being conducted in partnership with the Alzheimer’s Society and Innovations in Dementia CIC. These two organisations have helped us form an engagement group of experts by experience – the ALWAYS network (Action on Living Well: Asking You). The group advises us on different aspects of the project based on their personal experience, skills and expertise. For example, they helped formulate the qualitative interviews and provide valuable information on how best to approach people with dementia and enable them to tell their story. The ALWAYS group members are also helping to convey our findings to different audiences; for example, they recently gave a session at the UK Dementia Congress, and they will contribute to presentations at the British Society of Gerontology Annual Conference in 2017. What about people who develop dementia at a younger age and may still be working? Do they have different experiences to older people? People in this situation often say that they started making mistakes at work or became very forgetful and disoriented. Their behaviour may be put down to stress or depression and they can feel very confused and alone. People we have interviewed often describe a protracted period of trying to figure out what is going on that is very distressing for them. In this situation, diagnosis can come as a relief – at least they can make sense of what is happening to them, even if it isn’t something they welcome. On the other hand, services tend to be more geared to older people and may not always suit people diagnosed at younger ages. For younger people, the symptoms of dementia may present more acutely as they may be more noticeable sooner, but most people who develop the condition are of retirement age. In the early stages of dementia, it can be much more difficult for them to determine whether symptoms such as forgetfulness and needing more help from others are a normal part of the ageing process or whether they really have a problem. Very often it is a specific incident that triggers a sense that what they are experiencing isn’t normal after all. One person I interviewed said he used to laugh with his wife about his poor memory and then one day he got into the car and looked at the controls and couldn’t remember what they were for; this was the point when he decided to seek professional help. We have a number of participants in IDEAL who are living with early-onset dementia, and we will be able to look at their experiences in more detail. What about carers’ experiences? Studies show that caregiving can be very demanding but also immensely rewarding. Family carers are hugely important as they provide a great deal of support that cannot easily be replaced by formal provision. Over the years, we have learned that caring can be very demanding and stressful, but it also has many positive aspects. People can find meaning in providing care and in expressing the love they feel for their relative, and they may also experience a sense of doing the right thing, or of mastering the skills of managing a difficult situation. Most importantly, carers need to feel that there is somebody there to support them when required. The opportunity to link with other carers is also crucial so they can share experiences and ideas, as well as make personal connections with people in the same situation. One of our IDEAL PhD students is investigating the needs of carers who remain in the workforce and how we can best sustain the wellbeing of this group. Some carers are faced with a difficult transition when the person with dementia moves into residential care. This is not always the worst option – often people with dementia can do very well if the home provides high-quality care and is the right environment for them. Ensuring that care is person-centred and individualised is one of the biggest challenges that we face and is an area where psychologists can make a lot of difference. People with dementia are sometimes prescribed antipsychotic medication to manage behaviour such as agitation that can be distressing to observe and difficult to manage. Psychologists, and other health professionals, can help care staff develop alternative ways of dealing with such behaviour tailored to individual needs. This reduces distress for the person with dementia and allows the staff and their family members to interact with them in more meaningful and rewarding ways. Although family carers need support, it is also vital to protect the wellbeing of paid care staff, as working effectively with people with dementia can be emotionally demanding and require great sensitivity and practical skill. You mentioned your intervention work earlier. What methods do you use and how effective are they? I have always found it important to tailor interventions to individual needs, and people with dementia are a very diverse group. My PhD supervisor, Professor Barbara Wilson, emphasised the potential of rehabilitation and the need for practical benefits. I applied this philosophy in my work with people who have dementia, with the aim of enabling them to function at the best level they can, continue to participate in activities, and remain socially engaged. This led to the development of a cognitive rehabilitation intervention, which is an individual problem-solving approach to tackle the impact of cognitive impairment on everyday functioning and help people manage their everyday lives better. An initial pilot trial that I ran in North Wales with Professor Bob Woods had positive results, and we are now testing it in a large, multi-centre trial (the GREAT trial). In this approach, a therapist works with the person with dementia to identify personal goals that would improve their daily life - this could be something they would like to manage better, do differently, take up again, or learn for the first time. The goals are very practical – for example, somebody may want to go out shopping without fearing they will get lost, or may wish to cook a meal without getting distracted. We work with the person to identify potential solutions to help them maintain their independence. People with dementia can learn if we tailor our methods to match their abilities, while considering their environment and any risk factors. By helping people solve specific problems and finding strategies that work, we hope they would be able to apply this approach to other areas where they wish to make changes. This method doesn’t appeal to everybody, as some people feel they are already managing as well as they need to. We know, however, that it can help people to achieve their goals and manage everyday activities more effectively. Carers can also benefit from this approach by learning some useful strategies. Tell me about your arts-based programme – ‘A Life More Ordinary’. This project aims to create a series of activities and outputs to provide a positive but realistic portrayal of living with dementia. We are working with a group of well-known artists – photographer Ian Beesley, poet Ian MacMillan, and cartoonist Tony Husband. We organise workshops across the country for people with dementia and their carers and relatives using photography, poetry and drawings. Some of the resulting images will be used to create a touring exhibition to encourage more positive portrayals of people with dementia and their experiences of care. Stereotypes of dementia are so implicit that we often don’t even realise we are using them, and we hope that this initiative will challenge such views. The artists will be producing a series of ‘chat-books’ on different themes that will make the work more widely accessible. We are also planning an exhibition about how dementia has been viewed in art and literature over the centuries, illustrating how perceptions of the condition have changed over time and, we hope, prompting consideration of how our own current perceptions might change. We have also started working with the Exeter Northcott Theatre, directed by Paul Jepson, to explore how we can use performance to influence understanding of dementia and how best to support and care for people with the condition. We have an increasingly ageing population and the rate of dementia is set to increase dramatically. What are the implications of this? IDEAL will provide the first large longitudinal dataset exploring the experience of living with dementia over a significant period of time. It will be a unique resource for research in the UK and other countries, and will help to establish what kinds of services and support would be most useful. We need to consider the bigger picture in terms of the availability of funding: what are our priorities? What is society prepared to pay to care for older people, and especially those with dementia? Improved care for people with dementia does not always need to involve a drastic increase in resources – in fact, some improvements could be achieved by finding better ways of deploying resources we already have or integrating new techniques into existing initiatives. Currently, services can be quite fragmented, and it is challenging for people to navigate through the care system. This can be a huge source of stress for people who may also be coming to terms with a diagnosis of dementia. Providing people with a single point of contact where they can obtain information and help with accessing services on a consistent basis could be very helpful. We want to make sure that what we learn from the IDEAL project translates into improvements in care and support and leads to new initiatives to enable people to live well with dementia. 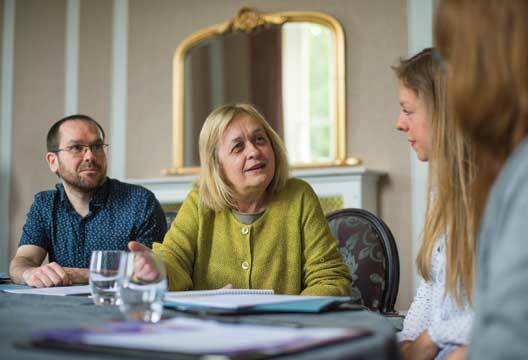 The British Psychological Society Dementia Advisory Group, which Professor Clare chairs, released a report last year: Psychological Dimensions of Dementia: Putting the Person at the Centre of Care. Find more on Linda Clare in our archive.